In a survival situation, one of the the primary must have tools is a knife. Without it, even making a fire drill to start a fire is a great challenge. Indeed the knife is a potential life saving item in a survival situation and although a 4"-5" blade is optimal, a tiny 1.75" bladed knife like the CRKT RSK MK5 Survival Knife is far better to have than to have nothing. With the preparedness of survival, the motto is generally that a tiny survival kit you have with you will will be 100% more useful that the 20lb survival 3-day pack left at home when a real survival situation arises. 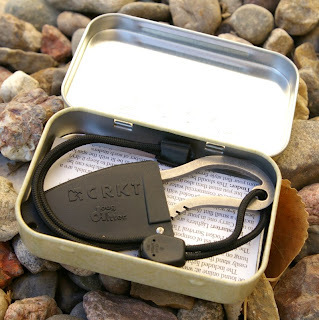 This methodology has spawned smaller and smaller survival kits with the Altoids Mint tin survival kit being one of the most popular. Many of us carry a tin of mints, so swapping fresh breath for a survival kit is an easy decision for the survivalist. The choice then becomes what to put in the kit, there are some heated discussions on this topic, however having some sort of knife included is a necessity everyone agrees on. The problem is that due to size constraints, this is usually a small Swiss Army knife or a replaceable utility knife blade (which can be somewhat dangerous to use without a handle.) 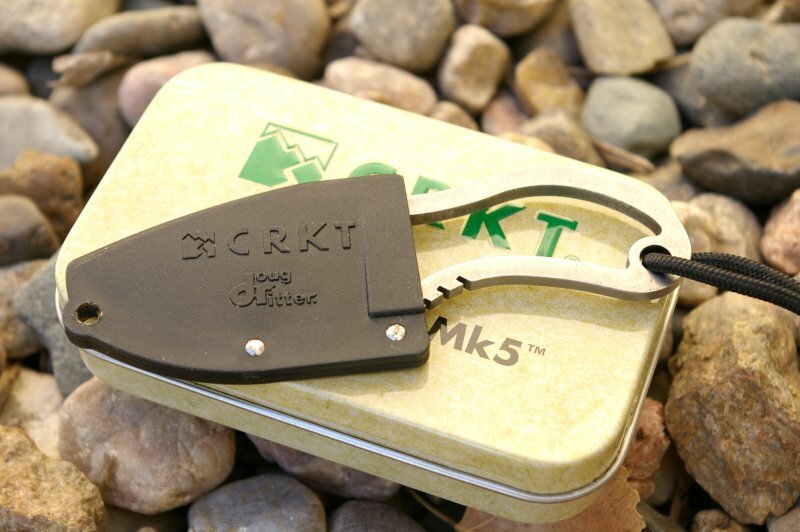 Generally I have favored a Christy Knife for my survival tin builds, however CRKT's RSK MK5 is the best high durability tin packable knife option I have found yet. 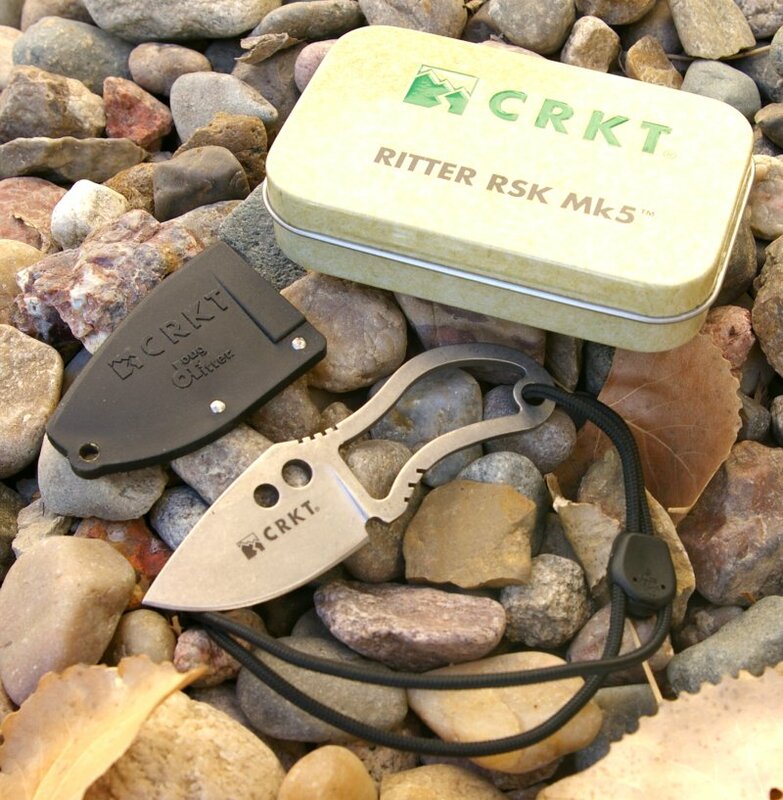 The CRKT RSK (Ritter Survival Knife) MK5 was developed by Doug Ritter, a renouned survivalist with the simple goal of creating the most durable and useful survival tin knife on the market. The strongest most durable knife design will almost always be a fixed blade knife and at the same time, will also minimize cost and reduce bulk which means you can pack additional items in the tin. Doug designed the stainless 2CR13 steel knife with a highly utilitarian drop point design, unique handle jimping, and lanyard which, when gripped in the hand, extends the grip in a way that makes it feel more secure like a much bigger knife. The adjustable lanyard is not only handy, but critical to the design as it functions as a handle extension when mounted in the hand correctly. Through his design process, Doug was able to maximize the blade length to a pretty useful 1.75" length all while still making it fairly comfortable to use while still fitting in the tin. 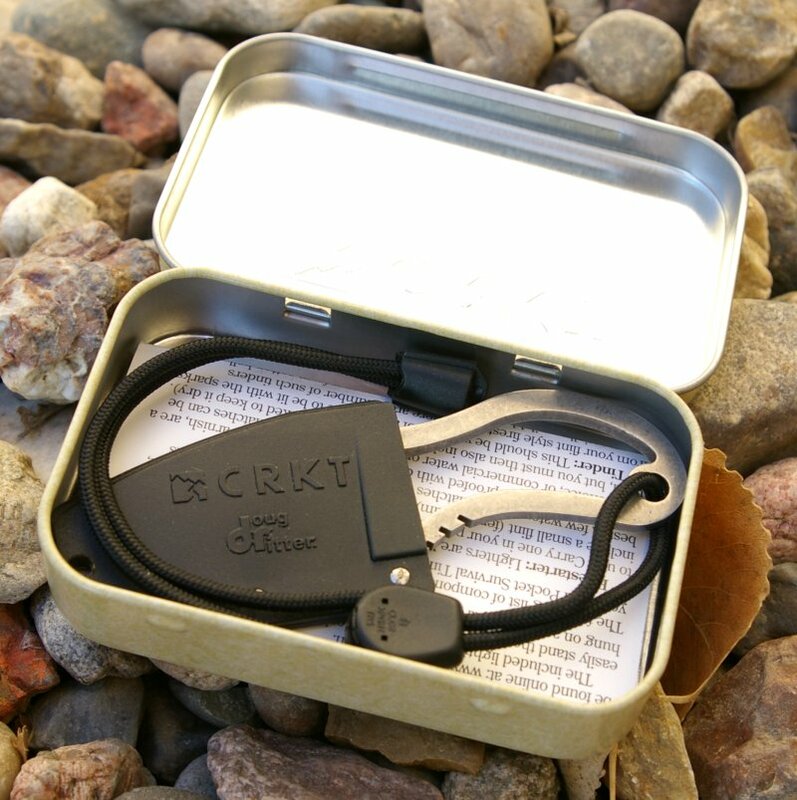 Included with the knife is a CRKT branded survival tin, lanyard, slim blade cover and a really good suggested list of items to include in your survival tin kit. In addition to Doug’s suggested list, I also make room for a mini-Bic lighter and rubberband a large black 50 gallon trashbag and clear trash liner to the outside of the tin for improvised shelter and water collection. In reality you can do a lot with a 1.75" blade if the edge geometry is right and the steel is high quality including battoning it through a thicker sapling with another piece of wood, clean fish or game, make weapons and fire... the uses are endless. The high grind of the little blade really makes the RSK MK5 a great little slicer that cuts deep. The RSK sailed easily through my typical whole chicken breakdown, however I did have to work at the joints a bit where I could have powered through them with a larger knife. If you live with the knife for a week in your pocket, I am sure you will find that that little blade delivers cutting utility and edge holding far greatly than the size would indicate. The slip on sheath as expected is minimalism, but 100% practical. A single hole in the end of the sheath allows the little knife to even be carried as a neck knife with a piece of optional cordage. Although small, great design attention has clearly been paid to assure this is a brutally tough little knife that will not fail you like a the typical scalpel or utility knife blade included in Altoids Survival kits. The 3Cr13 steel is similar to a high end 440 or AUS8 but with more toughness and corrosion resistance improved further with the stone washed finish. The CRKT RSK MK5 also has a skeletonized handle which means that you can lash it to a pole as a spear, or do things like wrap the handle with dental floss (a very handy and strong cordage that you can fish or build things with) and also provides a knife design over 30% lighter than one with a solid handle. Overall a thoughtful design which you should find plenty of uses for when you need it most. 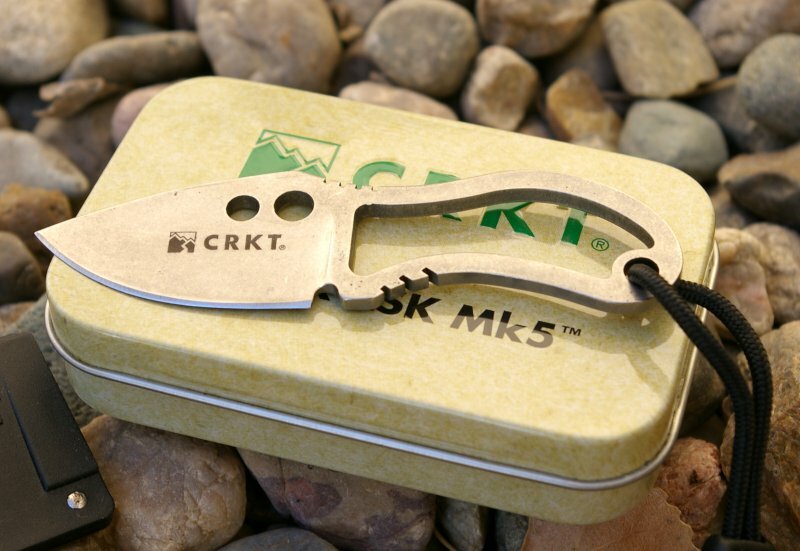 The CRKT RSK Mk5 is clearly not the survival knife I would reach for as I planned a walk into the woods or if I expected to fend for my life in a survival environment, however it is the one that you can guarantee will be with you should a survival situation occur. 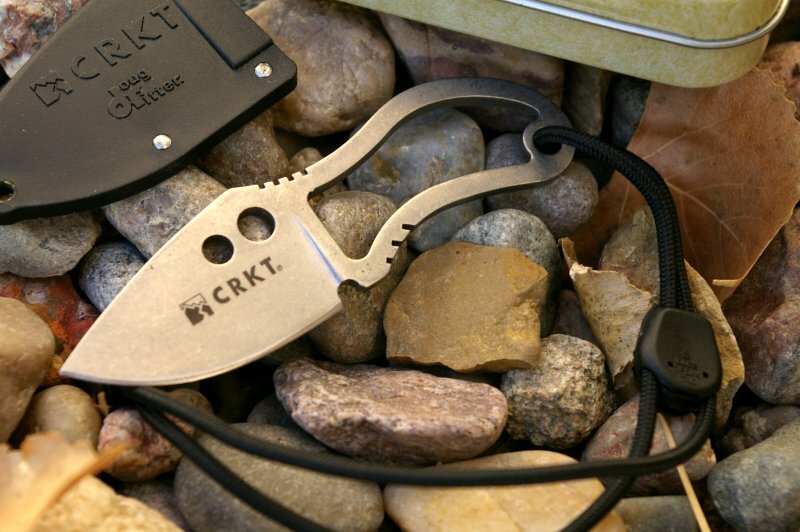 As with all CRKT knives, this is a high value knife at a great price. Although the MSRP price is $29.99, I picked mine up for only $22.99 which is a heck of a steal for a little, tough knife that just might save you life.